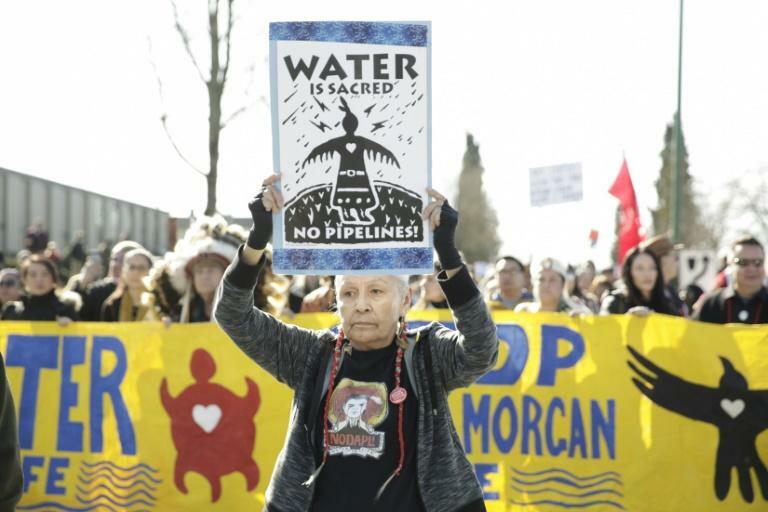 A Canadian court has sparked the ire of the oil industry by suspending the expansion of a pipeline to the Pacific over environmental concerns -- and dealt a huge blow to Prime Minister Justin Trudeau's climate plan. The Federal Court of Appeal on August 30 ordered construction halted of the Trans Mountain pipeline connecting the Alberta oil sands to the Pacific coast, saying regulators had failed to consider the impact of increased tanker traffic to the port of Vancouver on local killer whales. The Trudeau government, which regularly calls for global action to stem climate change, authorized the expansion of the pipeline in late 2016, along with two other new conduits. "It was a compromise to convince oil-rich provinces to do more in the climate fight, not less," said an editorial in the daily La Presse on Monday. Canada committed at a meeting in Paris in 2015 to reduce its greenhouse gas emissions by 30 percent by 2030 from 2005 levels, and by 80 percent by 2050. In order to achieve this lofty goal, Ottawa set a national carbon price with incremental increases to Can$50 per tonne of CO2 pollution in 2022. Alberta, which sits on the world's third largest oil reserve, bought into the plan, on condition new pipelines were built to reach new exports markets and ease its reliance on the United States. As the oil sands are Canada's single largest source of carbon emissions, its participation in the national carbon scheme is crucial. But after last week's court ruling, Alberta backed out of the deal. "Signing on to the federal climate plan can't happen without the Trans Mountain pipeline," Alberta Premier Rachel Notley told reporters. "With the Trans Mountain halted and the work on it halted, until the federal government gets its act together, Alberta is pulling out of the federal climate plan. And let's be clear, without Alberta, that plan isn't worth the paper it's written on," she said. In doing so, the province joins Ontario and Saskatchewan in vowing to fight a new carbon tax on strapped Canadians. "The Trudeau government is losing an ally in promoting Canada's plan to fight global warming," Pierre-Olivier Pineau, chair of energy management at HEC Montreal, told AFP. Greenpeace said Alberta's withdrawal "further weakens Canada's climate plan," which it contended was already insufficient to meet Canada's target for reducing greenhouse gas emissions by 2030. Calling on Trudeau "not to be pulled further down by Alberta", the environmental NGO urged the prime minister to "turn 180 degrees and align his policies to respect the Paris Agreement." Because Canada's provinces have jurisdiction over environmental matters, the federal government negotiated emissions targets with them last year. But it warned it would step in and unilaterally impose a carbon price if the provinces failed to advance their respective climate plans. Each had until September 1 to submit their plan to the federal environment ministry. British Columbia already had a carbon tax, while Quebec was part of a carbon market with California. Alberta, meanwhile, had set a CAn$30 per tonne carbon price in 2017. Pineau noted that Notley's social democratic government was only cancelling future increases of its carbon tax over the next three years. Trudeau -- who was scheduled to meet with Notley on Wednesday -- has insisted that the Trans Mountain pipeline will be built. His government bet big on Trans Mountain, buying it for Can$4.5 billion (US$3.5 billion) from Kinder Morgan, which had balked at the financial risks posed by interprovincial feuding and protests over its construction. Trudeau could seek relief from the Supreme Court, but he has signalled that he intends to first try to assuage the environmental concerns of the indigenous tribes that brought the court challenge. But the prime minister still faces significant obstacles -- Alberta's skittishness, legal challenges by Saskatchewan and Ontario, and a vocal Conservative opposition that is promising to nix the carbon tax if it wins election next year. "If Justin Trudeau continues to irrationally defend this pipeline, he will similarly defend his climate plan, he will press ahead if only to maintain his credibility," said Pineau.